Know this: Prince Harry’s wife “Meghan Meets Diana’s Secret Daughter!”. This exclusive is brought to you by Globe. Th daughter is Princess Sarah. She was allegedly “conceived in a bizarre fertility test before Prince Charles and Diana wed”. She met Meghan on Mrs Harry’s trip to New Zealand. And that’s huge news for many reasons. We’ve been here before, of course. In September 2016, Globe told us Charles has now fewer than “four! secret love children”. They had been “Found!”. So big was this news Globe was tempted to punctuate each word with an exclamation mark. We read that Princess Sarah was living in New England, USA. Her “surrogate” mother was “secretly” impregnated by her doctor husband who’d stolen a royal embryo produced by Charles and Diana on the orders of his mum, Her Maj. Sarah discovered the ‘”truth” because everyone told her she was a “dead ringer” for Princess Diana. But Sarah’s parents and Diana are all dead. And Sarah is also dead. 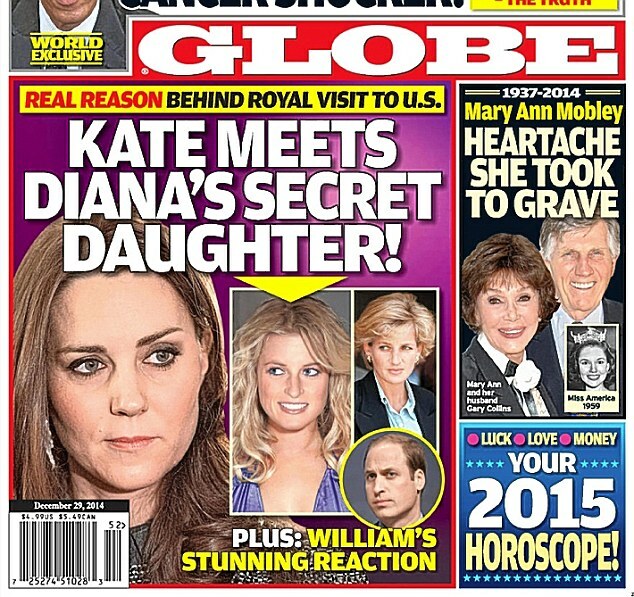 In June 2016, Globe told us: “Prince Charles Murdered Princess Diana’s Secret Daughter!” He did it, allegedly, on May 15. So who can we ask to corroborate the story? Meghan? More to follow as Princess Sarah communicates from beyond! the! grave!